FalkeEins - the Luftwaffe blog: An interview with Jan Forsgren, author of the new Fonthill Media title " The Junkers Ju 52 Story "
An interview with Jan Forsgren, author of the new Fonthill Media title " The Junkers Ju 52 Story "
Qu: Hello Jan, congratulations on the publication of your latest book " The Junkers Ju 52 Story " ! Can you tell Luftwaffe blog readers a little about yourself as a writer, person, historian. 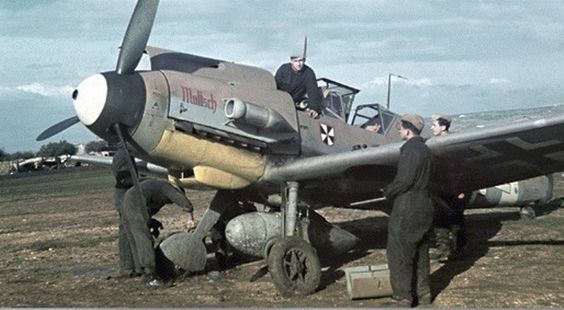 What prompted you to write about Luftwaffe aircraft and history? Why did you choose to write about the Ju 52 given that the type's story must be widely known ? Was it because it was widely used in Scandinavia? Is your interest more in civil aviation? I was born in Sweden in 1965, and ever since my childhood, I've been interested in aviation, and, in particular, aviation history. Over the years, this interest has grown steadily and considerably. However, I've worked professionally as an archivist for more than 15 years, as well as an English teacher in Bangkok for a couple of years. The latter was, in part, due to my strong interest in South East Asian aviation. My main research area, apart from historical aviation, concerns Cambodia, and, in particular, its relationship with Sweden between 1970 to 1990. Since 2010, I've been heavily involved in the Arlanda Civil Aviation Collection at Arlanda Airport just north of Stockholm I've written about 250 articles and six books, including two in Swedish and four English, the latter including Swedish Fortresses and Messerschmitt Bf 108 for MMP and Sinking the Beast and The Junkers Ju 52/3m Story for Fonthill. 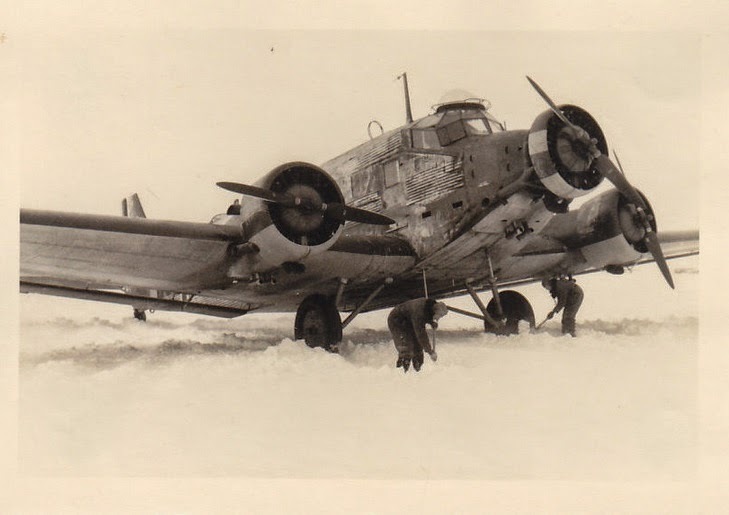 The Ju 52/3m Story came about simply because many other books concentrate on either the Ju 52/3m in Lufthansa or Luftwaffe service, virtually ignoring the other operators. My aim was to provide a concise, single-volume book on the Ju 52/3m, where I would attempt to cover the entire (an impossible task!) history of this deservedly famous aeroplane. Its use in Scandinavia did not, however, make me decide to write the book to any great extent. Qu: I have your Me 108 book via MMP which was nicely done but from here Fonthill looks like a step up, I'm tempted to say a 'real' publisher. (MMP don't pay their authors I believe) How did the book and your relationship with Fonthill come about? During an 11-day whirlwind tour of Britain in 2011 - from Solent Sky in Southampton to the Yorkshire Air Museum at Elvington and air displays at Waddington, Duxford and Old Warden, I met Graham Simons at the latter place. Graham casually mentioned that Jay Slater, then of History Press, was looking for new authors. Upon my return to Sweden, I sent Jay an e-mail along with ideas for books. He rejected my Swedish Air Forces since 1911, but thought that a book about sinking the Tirpitz would be just right. Sinking the Beast was published in August 2014, after which Jay requested more books! MMP does, incidentally, pay royalties, but it is only a pittance. From my point of view, MMP do publish off-beat titles, that few other publishers would accept. Qu: What was the most surprising or unusual fact you uncovered during your research? I would have to say the widespread use and longevity of the Ju 52/3m. It was, as most would assume, not limited to World War II but enjoyed civilian and military service long after 1945. Qu: How much time was devoted to the research and writing of this particular book ? And compared to your other books ? You mention the 'long, lonely hours' spent writing in your introduction. I bet it's hard work isn't it ? Do you look forward to how it might be received or are you not interested in what people might say about your work? The Ju 52/3m Story took me about one year to research and write. And, it is indeed hard work! I do look forward - with some trepidation - to the reviews and opinions offered by reviewers and fellow aviation historians. I am all too aware that some might say -'Oh, there's not enough Luftwaffe, Lufthansa etc', in the book, But, it is intended to be a general, concise overview of a great aeroplane. I do think, incidentally, that there are some areas, such as the French and Spanish use that have never been addressed properly in an English-language publication. That was my reasoning for including so much material on these Toucans and CASA 352s, instead of concentrating on its service with the Luftwaffe. Below; another Ju 52/3m of 4./KGrzbV 900 "GA+WW" assigned to Fw. Kramer also in Roslawl in February before flying into the pocket. Qu: I read recently that a Ju 52 'nearly' arrived in the UK during late 1944 flown by a crew deserting from Norway. I think it ditched in the North Sea just off the coast of Scotland. Is this a story you have heard about and what became of the aircraft and crew? I included some information on this fascinating episode, which is described in greater detail in the book by Martin Pegg listed in the bibliography. Unfortunately, I have no idea about what happened to the crew, presumably they became PoW's, and their Ju 52/3m scrapped or consigned to a sailor's funeral. The whole story must be in an AIR-file at the National Archives, but I haven't been able to locate it, yet. Qu: I have read that the Ju 52's 'star' shone brightest in adversity. I don't think this was really true was it? The type is associated with big defeats, Stalingrad, Indochine etc etc What's your opinion on this? The Ju 52 was surely also obsolete during WWII but was never replaced by a more capable machine. Why was this ? Logistic support and air transport are extremely vital in modern warfare. One might say that one of the major miscalculations in pre-war planning was neglecting the importance of airlift. The Ju 52/3m was obsolete in 1939, but it was available in large numbers, also being easy to operate and maintain under the most arduous and difficult conditions. It was slow, cumbersome but also a very efficient workhorse in its various roles. Its replacement with the Ju 352 and/or the Me 323 did not occur, which meant that the Ju 52/3m simply had to soldier on until the end of the war. Although both the Me 323 and Ju 352 were highly capable, Allied air supremacy meant that few Me 323s remained at war's end, while very few Ju 352s became operational. By the autumn of 1944, the production of transport aircraft was discontinued due to the desperate need for fighters. Interestingly, the highest loss rate in one day occurred on 10 May 1940 during the invasion of the Netherlands. 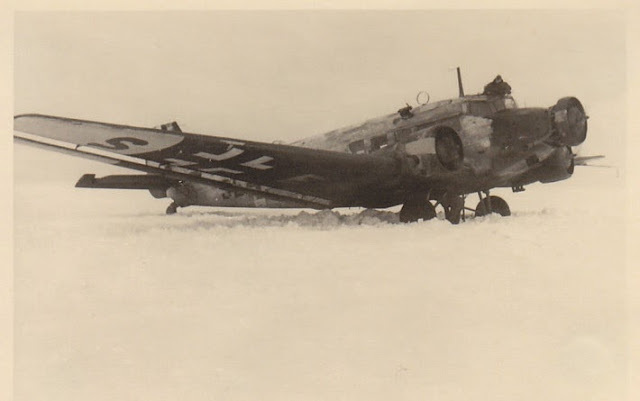 Also, Operation Merkur in May 1941 saw large numbers of Ju 52/3ms lost or damaged. However, both the operations over the Netherlands and Crete were German victories. One can say that the Ju 52/3m required total Luftwaffe air supremacy in order to operate without risking huge losses to enemy fighters and flak. However, the same can be said about Allied airlift operations, with both Arnhem and the crossing of the Rhine being examples of huge losses and wastage of transport aircraft. Qu: Many will know the Ju 52 from opening sequence of the 1968 war movie "Where Eagles Dare ". I guess that was a Casa 352 though? And did Hitler escape from Berlin in a Ju 52 as two British authors claimed back in 2011 in their book 'Grey Wolf'? In my book, I do mention that the Ju 52/3m that 'doubled' as a Luftwaffe aircraft in the movie Where Eagles Dare was a machine that was delivered to the Swiss Air Force in 1939. The winter camouflage applied for the movie was retained for several years. The Ju 52/3m in question was s/n A-702, now flying as HB-HOT. I've never seen any reference to Hitler escaping from Berlin in a Ju 52/3m. He elected to stay in Berlin, eventually committing suicide on 30 April. 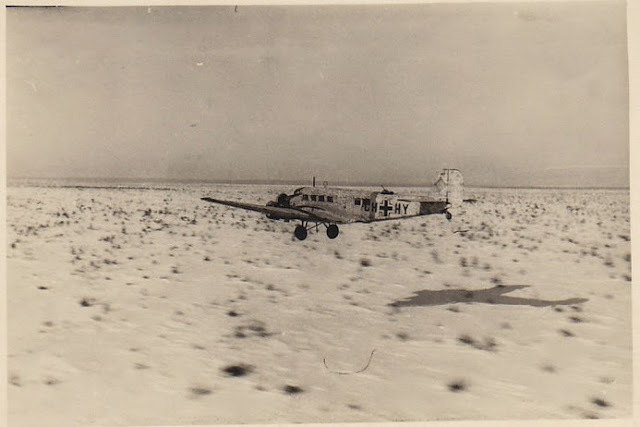 Two Ju 52/3m units did however attempt to drop supplies, losing some 30 aircraft. Qu: Aside from the Luftwaffe one of my big interests is the French Armee de l'Air so your coverage of the Toucan is very welcome. By the way the Toucan and Casa production lists in your book are very impressive. Did the French use the Toucan as a bomber ? Did it drop paratroopers at Dien Bien Phu? Do you know how many were lost in Indochine ? The French Air Force did indeed use their Toucans as level bombers, both in Indochina, Madagascar and Algeria. Due to lack of first-hand archival information, the exact number of Toucans lost over Indochina are unknown. I would assume that between 30 and 50 aircraft were written off to all causes, crashes, destroyed on the ground and wear and tear. Airlift operations over Dien Bien Phu did not include Toucans, but rather Douglas C-47s and Fairchild C-119s. Regarding Dien Bien Phu, I can highly recommend Martin Windrow's book The Last Valley. Regarding the French use of the Ju 52/3m/Toucan etc, I do believe this is a great topic for a book. Qu: Jan, your new book looks very nice indeed and it reads very nicely too as I can confirm. I thoroughly recommend it and I wish you much success with it. But what are you working on next ? Two weeks ago, I submitted the manuscript and 130 pics for a book on the Bf 109 to Fonthill, which is due to be published next year. Right now, I am working on books dealing with the Me 210/410 and Fi 156, also for Fonthill. I also have manuscripts completed for the Bell P-59 Airacomet and the Boeing B-17 in Military Service, both to be published by MMP. Re the latter, this will cover the B-17 in service with 14 countries, from Bolivia to Yugoslavia. I am still looking for additional pics of the B-17 in Luftwaffe service if anybody reading this is able to help I'd really appreciate it, thanks! 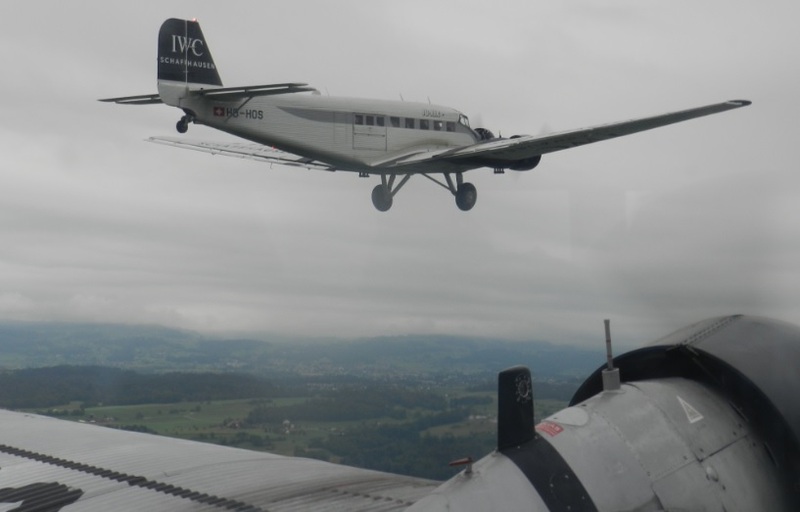 Below; "Junkers Ju 52 Story" author Jan Forsgren flew on board "Ju-Air" Ju 52/3m HB-HOT in Dübendorf last week as the guest of RIMOWA during the ceremony for the first flight of their new-build Junkers F 13. Note the Swiss Ju 52s have 'original' BMW engines with twin-bladed props unlike the well-known Lufthansa D-AQUI which has P&W engines with three-bladed props turning at higher revolutions..